I’ll cut to the chase: the newly-renovated Turkish Airlines lounge in Istanbul is amazing and easily the best business class and best Star Alliance Gold lounge I have ever been in. Passengers beginning their journey in Istanbul can use dedicated check-in kiosks and a self-serve lounge entrance (simply scan your boarding pass and the gate opens) to bypass all interaction with Turkish staff. A common complaint when the lounge first opened was slow wireless internet–indeed, I found that to be the case during my first visit to the lounge. But the problem is now solved: the internet is now password-protected and provided by a different company with a noticeable improvement in speed. The pictures above do not do this lounge justice–Turkish is a rising star in Star Alliance and a trip on Turkish Airlines and stop in Istanbul is well-worth your time, even if you have to go out of the way. Thank you so much for posting. I’m really sorry I missed it when I was there in May. Gorgeous… definitely on my list to hit in the future. I’ve visited the TK lounge several times in the past two months, and it is absolutely one of the best *G lounges in the system. Shower rooms, sleeping rooms, many food and drink choices, many seating options, entertainment options. It’s an all-around awesome lounge. And TK has got quite a good long-haul business class product too, especially aboard 77W. Was the pasta better than the LH lounges? @FriendlySkies: The pasta was good, but not better than LH. LH had meat sauce, which TK did not have. But both were excellent and the TK pasta was so good I ordered it on my flight (it looked nearly identical). I missed the sleeping room but found the recliners to be pretty comfortable. Would they have let me sleep overnight in the sleeping rooms or ask me to vacate at around midnight? I agree with Matthew, this is a great lounge. I can’t think of any better except for the services provided at the FCT in FRA. The Turkish lounge felt like a resort sans the pool. For all I know there’s a pool area off the kid’s space that was closed due to snow! For full disclosure, note that I was not offered any compensation by the airline or Star Alliance. In fact, I was concerned that I would not be admitted since my departing flight was at 5:00 am the following day. No issue. Left airport for several hours and again had no issue returning to the secure side of the airport. Asked to leave my backpack near the concierge — no issue. In comparison at LAX my bag was removed from the Red Carpet Club and sent to baggage claim because I left it unattended for 90 minutes when I stepped out for dinner. They knew it was my bag. Knew I stepped out for a bite. Knew I was on the 11 pm red eye. Knew my cell # and yet no call, just removal of my bag. Fine — I should not have left it but tell me if my bag were somehow dangerous ere the people in the baggage claim area more dispensable than those in the lounge? Hi, not sure if my question will be answered since this looks like an old post but thought id just throw it out there lol. I will be traveling with my husband and six kids from Toronto to Beirut, connecting in Istanbul. We booked our tickets through Aeroplan, all business class. Unfortunately we only found business class seats enough for us all from Toronto to Istanbul, but all seats were full from Istanbul to Beirut, thus economy seats were reserved for us on that flight.We have an 11 hour wait in Istanbul and my question is will we be allowed to use the business lounge in Turkey even though we will be connecting economy although we payed business? Note that both flights are Turkish Airlines. If the flight to BEY is the first available TK flight after landing in Istanbul, you will be entitled to a free hotel room for each traveller. Technically, you do not have lounge access in Istanbul, though I would literally get on my knees and beg for it if I were in your shoes. What a great way to pass the layover. The airport transit hotel is nice, but very pricey. Keeping checking the IST-BEY flight for openings in business class. Even if one or two seats open, you can divide the record and take whatever is available. Generally, on those narrow-body flights there are never more than 2-4 business class award seats allocated at once. thanks Matthew for the quick reply, i was also wondering since Turkish Airlines are part of Star Alliance would we be given business seats if available upon check in? @momofsix: Sadly, the answer is a definite no. TK will see the flight booked in economy class and will refuse to modify it. Just keep checking the flight and give Aeroplan a call immediately, even if just one seat opens. Thank you for these lovely photos! It sure looks good 🙂 I’m trying my luck with this question, if you might know more. I’ve a economy class flight from JFK-IST-KUL in a couple of months’ time. I’ll have a rather long layover that I plan to use mainly for a city tour. I recently got the MileagePlus Explorer card that comes with two United Club passes. My question is would I be able to gain access to this very nice Turkish Airlines lounge with the United Club pass? I have no gold status in any alliance right now. Would appreciate your thoughts. Thank you! Hi Christine, Sadly, you would not have access to the lounge with your United Club card passes. The only suggestion I could offer would be to buy a refundable business class ticket, say from Istanbul to Beirut, use the lounge, then refund the ticket. Perhaps that is not worth it, but I cannot think of another way to get into the lounge. Thank you for getting back so promptly. Really appreciate it 🙂 Aaah, that’s a shame but I suppose I can get some rest at the PrimeClass Lounge on a pay-per-use basis. The Istanbul-Beirut plan does sound tempting,though! 😉 Thank you, again. Safe travels. You will have access the lounge. My husband and I are trying to book a flight Cairo – Dulles Airport Washington around Mid Dec. We can’t afford Business Class this time. My husband holds a Gold Star Alliance Card. If we chose to fly Economy class Turkish Airways (with a stop over in Istanbul) can he access the Turkish Airways Lounge? Is a he allowed a guest to the lounge? we are keen for this airways because it allows 2 pieces of luggage on economy class. If we can’t access the lounge, can you suggest another route that allows 2 pieces of luggage and access to the lounge for econmy class for both of us. Yes, with a Star Gold card you and your husband will be allowed to enter the Turkish Lounge in Istanbul. Enjoy! Airlines. The brochure says 10 hours or longer….are they that sticky with the time? Also will we have lounge access since the flights are always delayed on depart anyways? They are very picky and with near 100% certainty they will deny the hotel, though it never hurts to ask. Is your flight to TLV the first one in the schedule or did your deliberately book in a 9.5hr layover? If you want the lounge, consider buying a fully-refundable business class ticket, using the lounge, then canceling the ticket. There are ethical ramifications, but it is the only viable way–Star Gold is difficult to purchase and thousands of dollars when available through US Airways. Traveling business class on TK in October. I will have a 17 hour layover each way in Istanbul. While I qualify for a hotel room, I would prefer to stay in the airport. Will I be able to stay in the lounge overnight? Would I be able to use a sleeping room for up to 7 hours? Thanks for your help! @Janet: You will have lounge access and access to the sleeping room if you are flying in business class. You will only have access to a hotel room if your 17hr layover is necessary, i.e. there is not a TK flight departing any sooner to your final destination. Thanks, Matthew. Yes, traveling business class. And — sadly — 17 hour layover is necessary — no flight sooner. appreciate your help. Hi, how does it work travelling with children at these lounges? My wife and I are passing through Istanbul with Gold status but are flying economy and will have our three children with us. Thanks. You are entitled to one guest only with gold status, though I bet if the children are young enough they will be allowed entrance. But it would be up to the goodwill of Turkish. Great post. Thanks. One question: I have a United Club membership. Will I be allowed access? The Star Alliance lounger finder tool states I have access to the Turkish Business Lounge but not sure if the lounge you visited is the same one…(the airport map shows two lounges). Speaking of which…is the domestic side lounge just as nice? 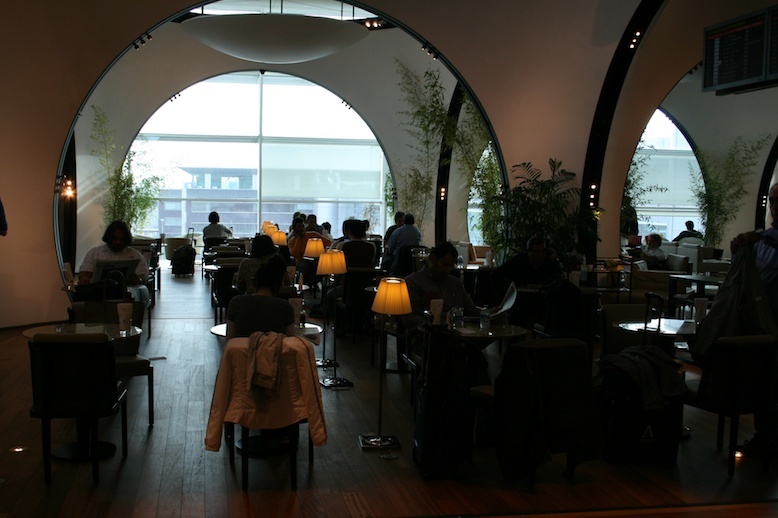 Dan – I had United club and was allowed into the lounge with a guest. Was flying Turkish in economy if that helps. Have a good trip. I have miles or more frequent flier—-I am flying economy to Mumbai via Istanbul on Turkish……can I get free access to any business lounges at Istanbul? May I know the hours of the IST Business Class/Star Alliance GOLD Lounge—are these hours daily? So beside myself to experience the lounge, the photos are wonderful, am sure reality is even better!!! I have United MileagePlus lounge access coupons from Chase, can I access the IST lounge? I am Star Alliance GOLD member. My flight in October from SCQ arrives in IST at 945PM—I will then fly TurkishAir again the following morning at 0815A. Can I use the lounge until it closes, just hang out at the aiport for several hours, then go to the lounge again until I leave for my flight? I am flying Economy, by the way! @ILPOPP — The lounge is open for 24 hours, so I would not even leave the airport. Just head right to the lounge and enjoy yourself. If you’re early enough, you might even be able to get a sleeping room for the night. Doesn’t matter that you are flying economy class as long as your Star Gold status is valid. Be sure to bring your card along. We will fly to Bangkok via Istanbul Business Class in december. Is there a Smoking Rom within the lounge? There is not. But outside in the terminal (second floor) there is a smoking room. Signs will direct you to it.